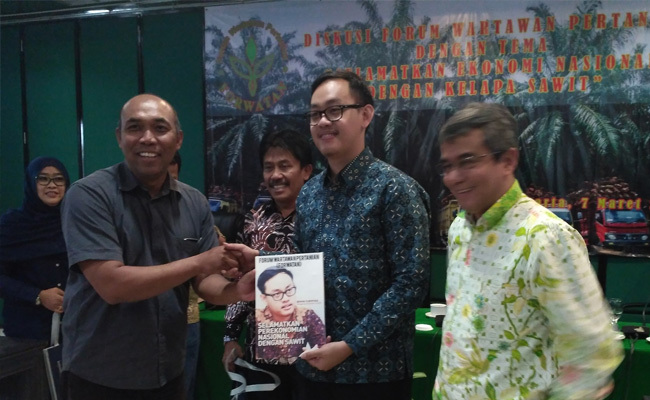 InfoSAWIT, JAKARTA – Economic observer from Institute for Development of Economics and Finance (INDEF), Bhima Yudistira Adhinegara, said, palm oil industries nationally have four superiorities for the economy in Indonesia. The first is, palm oil plantation could hire up to 8,2 millionmen–about more than 4 millionsmallholders involve in it, and more than 13 millionare indirect workers. The second, based on some international study, the income of the people out of Java island working in palm oil plantation sector is four times higher than the poverty. The third, palm oil could increase the work of manufacture sector, namely to increase the food and drink industries reaching 9,23% in 2017. The fourth for sure, palm oil is the biggest exchange provider in Indonesia. He continued, the exchange in 2017 reached Rp 300 billion. “The portion of palm oil export to the total non oil and gas export reached 15,1%,” he said in a discussion that Forum Wartawan Pertanian did andInfoSAWIT also attended, Wednesday, (7/3/2018) in Jakarta. He also mentioned, having such superiorities to support the economy and exports, the government should rely on palm oil to help the target of export progress reaching 11% in 2018. But palm oil is not full of innovation. He thought, in 2017, according to Global Innovation Index, Indonesia was in the 87th rank, while according toGlobal Competitiveness Index, Indonesia was in the 36th rank. It means, he continued, it needs many innovations to increase palm oil competitiveness.